I use transparencies often in card making. If you haven’t, don’t be intimidated by the slick surface. You can stamp on them, fold them and glue them to paper easily. 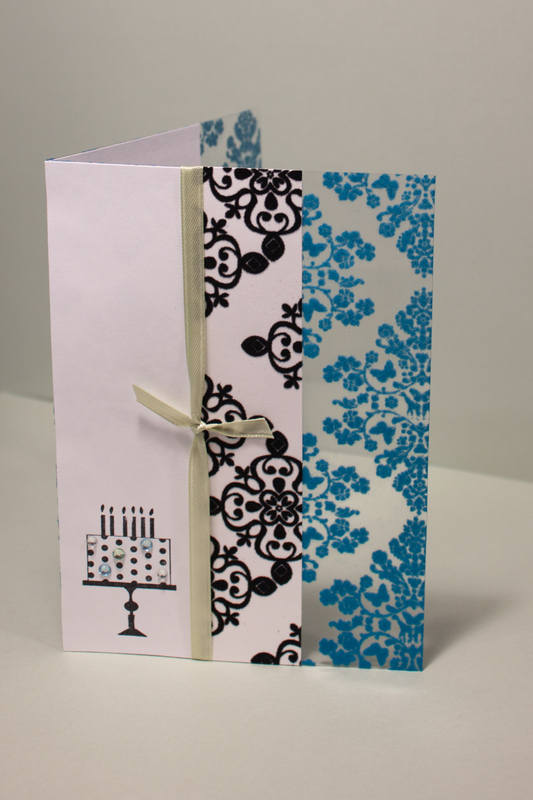 To fold a transparency for a card, it’s best to have something to score the fold with. I have a scoring blade for my paper trimmer. It’s really just a dull tip, which is great for paper, too, because it won’t cut through it. I use my trusty tape runner to adhere cardstock to transparencies, but to adhere transparencies to cardstock, I use a small dots of glue that dries clear, such as Aleene’s Jewel-It. I’ll feature stamping on transparencies in future posts. The key ingredient: Staz-On ink. It’s permanent and usable on many types of surfaces. This card’s transparency is flocked, which is something I’d never seen before. I upped the fuzz factor with flocked patterned paper. This entry was posted in Birthdays and tagged birthday, flocking, transparency. Bookmark the permalink.